The practice of ethics seems to have been forgotten – or perhaps ignored – as technology has improved. At every turn, we seem to find examples where someone realized they could do something without stopping to ask if they should. Further, the long-lasting and wide-ranging impact of technology is not fully understood. We're only beginning to see the dangers that lie ahead. Who's at the helm to steer the ship through these rocky ethical shoals? Would you consider leaving a rating or review for the show on Apple Podcasts? It helps other people find us. Credits: Theme song: Afternoon by Maestross is on a royalty-free license from Jamendo.com. Subscribe on Apple Podcasts, Google Podcasts, SoundCloud, Spotify, Stitcher, or wherever you get your podcasts. 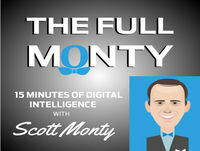 Or try this: ask Alexa or Google Home to "play the latest episode of The Full Monty podcast."